We believe everyone wants to achieve a vibrant, pain free healthy life full of activities they enjoy! ~Are you suffering from repetitive use syndrome, an injury, aches, pain, inflammation, or a joint condition? ~Do you want a long lasting solution to free yourself from pain? If your answer is yes, you've come to the right place for a solution! 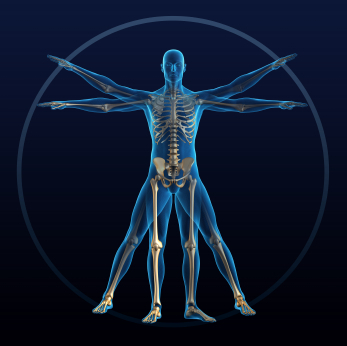 We have a proven method that gets to the root of pain by returning the body to proper alignment, function and balance. Posture Correction: Does it matter? Over time, the way we use our bodies through physical demand, repetitive motion, and even lack of motion may cause our posture to become imbalanced. This deviation from our functional design causes musculoskeletal compensation, pain and injury. This affects the whole skeleton and leads to muscular imbalances, compensations, and abnormal wear and tear, which results in joint degeneration and pain. 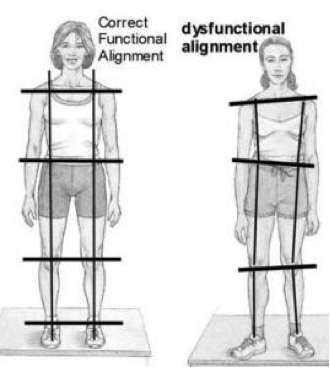 Misalignments can also affect the performance and function of other bodily systems. We teach our clients exercises to help strengthen and correct posture deviations in a unique way. These exercises can be performed in the comfort of your own home and can improve the effectiveness of other medical treatments. Please wear or bring light-colored, workout-type clothing. Your therapist will want to see your shoulders, hips, knees and ankles. For women, please wear a tank top and shorts. For men, please wear a t-shirt and shorts. You can bring your clothes to change into if you choose. During your first visit, you will begin with a conversation about your reason for coming to us. This is followed by taking you through a process of assessing your posture and designing a customized exercise "menu" specific for relief of your pain condition. The assessment phase includes postural assessment, functional muscle testing, gait analysis, and postural digital photos to assist in pinpointing any compensation and dysfunctions that could be causing pain. The results of your assessment will be used to design an appropriate posture program and to give you a better understanding of what is happening in your body to cause your imbalance. A customized exercise "menu" will be designed using your assessment data and processing through our specialized exercise computer program. Your "menu" will consist of a series of specific stretches, gentle exercises and positions that will focus on your whole body because we are not just addressing your symptoms. We are looking at how a misaligned posture may be causing your pain. The goal of your "menu" is to reeducate (remind) your muscles how they need to be functioning and correctly realign the eight load-bearing joints of the body to restore function and eliminate pain. We will walk you, step-by-step through your exercise "menu" to be sure you know how to do them correctly. It is important for you to perform them regularly for your program to be effective. A take home printout or an email copy of your exercise "menu" with instructions for how to complete them will be given to you at the end of your session. Soreness is normal and should diminish the more times you do your exercises as your muscles adapt and adjust. Keep in mind that soreness is different than pain. If you are experiencing true pain be sure to let your therapist know so any necessary exercise adjustments can be made. We ask that you do your exercise menu daily at your home, office or anywhere convenient. Your therapist will suggest the desired amount of time between appointments. Remember, this is a process, and your body position will be changing. Therefore, it's important you return for a reevaluation to adjust your menu according to your progress and to continue the process of getting the body back to its original design blueprint and pain free. Our health and lifestyle nutrition coach is available to assist you with setting and accomplishing your goals. If you have behaviors that may block you from performing your exercises, our coach can help you modify sabotaging behaviors to keep you on track. Our post-rehabilitation program is designed for those individuals who are recovering from a variety of musculoskeletal disorders. We work with special populations who have received medical clearance to exercise in a non-clinical setting. We manage clients after discharge from rehabilitation services to bridge the gap between medical rehabilitation and post rehabilitation. Post rehabilitation exercise will help maintain the functional gains made in physical therapy, occupational therapy or chiropractic care and improve level of function and injury prevention. Our experience has proven combining massage and bodywork therapy with corrective exercise and posture therapy creates accelerated results. Clinical massage and bodywork therapy is designed to reverse the negative cycle of pain in joints and muscles. This therapy prepares the body to respond optimally to rebuilding and restoring efficient postural alignment, function, balance, fitness, vitality and overall well-being. Recovery of overuse syndromes, injuries and muscle imbalances brought on by excessive postural stress. Our programs are designed to help people of all ages, regardless of athletic background, treat musculoskeletal pain and "dysfunctions" without drugs or surgery. We will customize a program that is realistic and practical for your lifestyle and goals. Call us today for more information, or to schedule an appointment. * The Egoscue Method® is the world leader in non-medical pain relief - a postural alignment therapy with a 94% success rate of long term pain relief.